Nine West watch battery replacement from the online battery specialists; WatchGnome.com. Don’t let just anyone complete your Nine West watch battery replacement, trust a team that handles thousands of watches a year. Watch Gnome is America’s #1 online/mail-in watch battery replacement service. Watch Gnome is leading a revolution, where you can save time and money on your next watch battery replacement service. 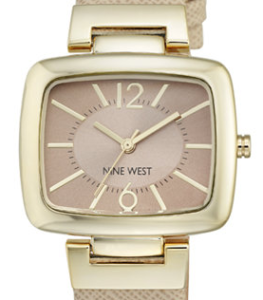 Order a Nine West watch battery replacement service today. Everything Included Watch Box: Order a Nine West watch battery replacement box from Watch Gnome. Our kit includes everything you need to send your watch in for service, all packaging, return label, tracking and in-home pickup! Send Us Your Watch: Once you receive the “everything included” box, pack up and send us you watch. You can even request free pick up from USPS (included) all for one low flat fee. The Battery Replacement Process: When your watch arrives in our workshop, we get right to work on your battery change. We first inspect your watch, we then remove the caseback. We replace your battery and clean the inside of your watch before sealing your watch back up. Finally, we clean the outside of your watch. Return Shipping: Our service is usually completed in about 1 business day. Your watch will then be packed with care and returned. Return shipping with tracking is included in all our services. The founding of the Nine West brand stemmed from it’s original location in the Solow Building 9 on West 59th street. Founded in New York City, the brand has since expanded to over 800 locations in almost 60 countries world-wide. Initally launched as a footwear brand, Nine West expanded to bags, handbags, sunnies, jackets and watches. Nine West also produces a variety of accessories to match it’s popular product lines.